My team has configured TFS to automatically kick-off continuous integration (CI) builds when developers check-in changes. The build depends on the affected area, and the time to complete depends on the build. Some of our builds contains hundreds of projects and thousands of unit tests, and these can take the better part of an hour to complete. We also have nightly builds that build even more and take even longer. Occasionally, I’ll have some changes to check-in at the end of the day. I check them in, and I get a notification that I broke the build when I’m halfway home. Crap. I need to fix the change before the nightly build starts, or it’s going to break, too. Wouldn’t it be great if there was a way to run a build with my pending changes and then check them in automatically if the build succeeds? Well… There is! 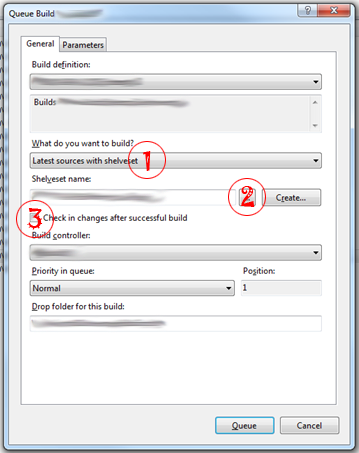 TFS has support for private builds (or “buddy builds”) that you can queue with a shelveset. When I choose to queue a build, I choose to build with local sources plus a shelveset. Then I specify which shelveset, and I have the option to check-in my changes if the build succeeds. Splendid!